PORT MORESBY, Nov. 16 (Xinhua) -- Chinese President Xi Jinping said here on Friday that he hopes his ongoing visit to Papua New Guinea (PNG) would help boost relations between the two countries. 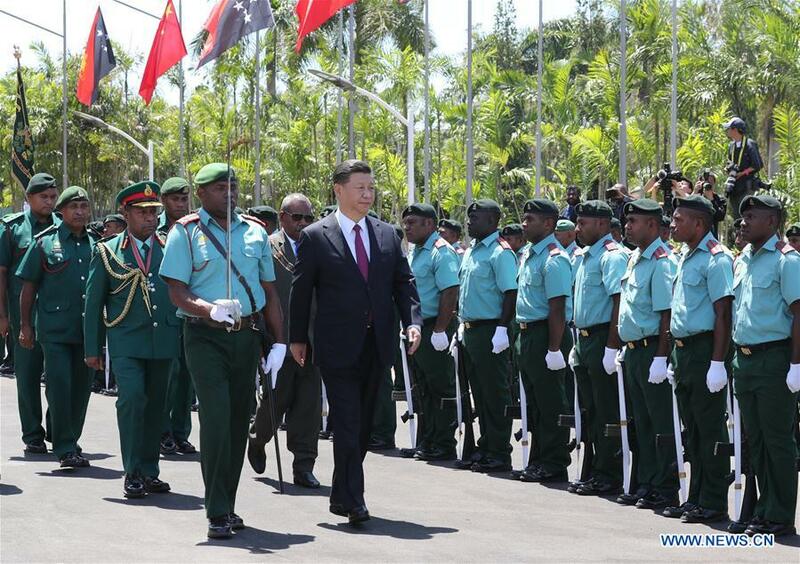 During the meeting with PNG Governor-General Bob Dadae, Xi pointed out that this is not only his first visit to PNG, but also the first-ever state visit by a Chinese president. Thanking the PNG government and people for the warm reception, Xi said interactions between China and PNG go a long way back. Since the two countries established diplomatic ties in 1976, cooperation between China and PNG in various areas has witnessed fast expansion, which laid a solid foundation for the development of bilateral relations, he said. Xi said the Chinese side has attached great importance to relations with PNG, and that he hopes his ongoing visit would help boost bilateral relations, expand all-dimensional exchanges between the two countries, promote friendly communication between the peoples, and push for fruitful results in practical cooperation in a broad range of areas. The Chinese side is staunchly committed to strengthening solidarity and cooperation with Pacific island countries including PNG, Xi said. Extending warm welcome to the Chinese president, Dadae called the visit a rare and grand event for his country in years. PNG and China enjoy profound friendship, he said, noting that there were Chinese traveling to and settling down in PNG more than a century ago. PNG established diplomatic relations with China the year after its independence, he said, adding that the visit by Xi is a milestone event for bilateral relations. The governor-general thanked the Chinese side for its precious assistance to PNG in areas concerning national development and people's livelihood such as infrastructure construction, education and health. He also thanked China for its great support for PNG in hosting the Asia-Pacific Economic Cooperation Economic Leaders' Meeting. PNG is ready to join efforts with China to lift the two countries' relations to a higher level, he said. Prior to the meeting, Dadae held a grand welcome ceremony in Xi's honor in front of the national parliament house, featuring a 21-gun salute and folk dances.